“You have the right to remain silent.” So begins the reading of the Miranda Rights. The name stems from Miranda vs. Arizona (1966), a landmark court case that ended when the U.S. Supreme Court decided that all suspects have to be informed of their civil rights (especially their right to an attorney) during apprehension or arrest. 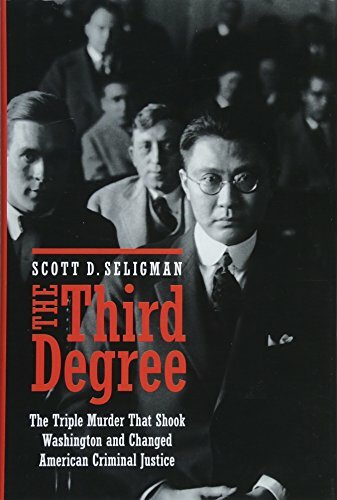 Scott D. Seligman’s book The Third Degree provides the history of the court case that likely paved the way for Miranda. In 1919, three Chinese diplomats—Chang Hsi Hsie, Dr. Theodore Ting Wong, and Ben Sen Wu—were found murdered inside of the Chinese Educational Mission in Washington, D.C. All three had been shot with a rusty revolver that belonged to Wu, the youngest of the three. Washington police officers quickly dropped the dragnet on a pair of Shanghainese brothers named Ziang Sung Wan and Tsong Ing Van. The bulk of The Third Degree discusses how Wan and Van were given the “third degree” by detectives for days until Wan confessed to the murders. In case you do not know, “third degree” is an older euphemism for police brutality, especially the type of brutality that is used in interrogation rooms in order to extract confessions. While the police in D.C. did not physically abuse the brothers, they did resort to racist name-calling, sleep deprivation, and intimidation. All of this was made worse by the fact that Wan was at the time suffering from the lingering effects of the Spanish flu and a terrible case of spastic colitis. Under duress, Wan admitted to murdering Wu in retaliation for Wu’s killing of Hsie and Wong. The jury believed this confession at Wan’s first trial, even despite the fact that the defendant had recanted his own words. From 1919 until 1925, Wan would be imprisoned in Washington. He always maintained his innocence, and also adamantly claimed that his confession had been coerced. The Supreme Court of the United States would ultimately decide in Wan’s favor after years of botched appeals and public outcry against the “third degree.” Wan became a low-level hero for civil libertarians, but, in a cruel twist of fate, the man who fought so hard for his civil rights in America later died in a communist prison in Maoist China. Here, Wan, a Christian, member of the bourgeoisie, and a supporter of the Chinese Republicans, was defended any semblance of civil rights. The Third Degree may look like a true crime potboiler, but it is much closer to a legal history. Seligman provides his readers with a lot of legalese, and The Third Degree is primarily concerned with how Wan’s trial established an early groundswell of energy against violent police tactics. The one time when the book returns to the actual murders themselves (which occurs in the Epilogue), Seligman makes the somewhat shocking confession that the D.C. police had the right man all along. The possibility that a murderer escaped justice is not the concern of this book. Rather, The Third Degree cares only about how this one particular case helped to create the civil rights that many Americans take for granted every day. In this regard, the book excels, for Seligman writes with speed and interest about the often dry world of criminal law. The Third Degree is a fascinating and easy read that can be consumed in one sitting. If you do decide to do so, then you will end the day much smarter, for this book is highly informative.